John Douglas Thompson. Giuliano photo. 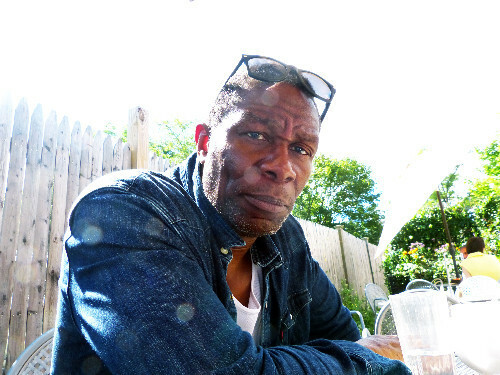 There is a significant difference between actors, like John Douglas Thompson, who focus on theatre and those who establish careers working for the cameras of film and television. The assumption is that theatre and film/ television are interchangeable. It takes weeks of rehearsal to develop a play. The performances over a month or more take stamina and focus to involve a fresh audience night-after-night. Often the actors dig ever deeper into the character from the first day of table work until the final curtain. On many movie sets and for television series there is little such time to develop a character. A day of shooting entails what may be a single scene when edited. For film and TV the actor speaks directly to the camera. On stage there is the need to project to the top row of the balcony. Clearly there are different skill sets and reasons why actors focus either on stage or screen with the occasional overlap. Broadway producers often build productions around the marquee attraction of Hollywood stars to sell tickets. Actors who are successful on stage, however, are attractive to Hollywood directors. Rylance was nominated for an Emmy for his work on the PBS series “Wolf Hall.” Widely regarded as among the finest actors of his generation, now 55, he is becoming known to American film and television audiences. The approach of the classical stage actor, Thompson, who is also widely respected and acclaimed (Obie and Drama Desk awards), is primarily focused on theatre. It is where he feels most fulfilled. Last year he earned critical acclaim in New York for his role of Joe Mott in the all-star cast of Eugene O’Neill’s “The Iceman Cometh.” He starred in the demanding “Tamburlaine the Great” by Christopher Marlowe (1564-1593) a contemporary of Shakespeare. In 2009 he was reviewed by the New York Times for the lead role in “Othello.” Between Shakespeare and Company (two productions) and Theatre for a New Audience he spent a year performing what he views as the defining role in the canon. Since then he has been fully booked with opportunities to take on roles that challenge him. In the fall of 2015 he performed the one man show “Satchmo at the Waldorf” by Terry Teachout with performances in San Francisco, and Colorado Springs. It is a role he originated for Shakespeare & Company. From April 30 to June 12, 2016 at Theatre for a New Audience Arin Arbus will direct Thompson in Henrik Ibsen’s “A Doll’s House” and August Strindberg’s “The Father.” They will be presented in repertory. Previously he performed as Judge Brack in Ibsen’s Hedda Gabler at the New York Theatre Workshop directed by Ivo von Hove but this will be his first role in a Strindberg play. There is synergy between the plays which were written in response to each other. This summer Thompson starred in “Red Velvet” for Shakespeare & Company. For just one performance Ira Aldridge performed the lead role of Othello for a major London company. For historical as well as personal reasons taking on the role of Aldridge entailed collateral damage. There was an emotional exchange when I spoke with him just days after the last performance of that play. He discussed the demanding process of going out on stage each night and inhabiting the persona of the individual who not only broke the racial barrier but also introduced a new naturalism that changed the craft. Having inhabited Aldridge for several weeks we interacted during a time of transition entailing leaving behind a great role that may never be revisited. In sports they describe an athlete as leaving something of himself on the court or field. Going deep to find a complex character like Aldridge, Othello, Joe Mott, Brutus Jones, Richard III or Tamburlaine there is always something left behind. Actors decline to discuss exploring the inner depths of life experience to tap into aspects of the characters they portray. Not that this is always the case with actors. Some are capable of slipping in and out of roles as readily as one changes clothes, makeup or costumes. The great actors go deeper than that and seek the most demanding and challenging roles. Charles Giuliano At various levels from graduate school to Broadway (“Julius Caesar” with Denzel Washington) you have performed a number of the iconic roles of Shakespeare: Shylock, Marc Antony, Richard III, Macbeth. You have mentioned wanting to perform Hamlet and eventually Lear. Fairly early in your career you did Othello for A.R.T. (American Repertory Theatre). JDT I’ve done six or seven Othellos. I did one in 1994 as a student while in drama school. The next one was 1998 or 1999 at Trinity (Repertory Theatre, Providence). Then the following year at A.R.T. Then up here (Shakespeare & Company). Then in New York and back up here again. That role I still continue to play with. CG You have made it clear that film and TV are not your primary focus but you just did a film. JDT It’s called "Wolves" and will probably come out in a year. The director was Bart Freundlich who is Julianne Moore’s husband. I did about two and a half weeks on it. It was shot in New York and surrounding areas. I play an ex NB player who has fallen on hard times. I figure that it will take me about the same amount of time to have success in films as it has taken to be successful in theatre. CG You are scheduled to appear in “Satchmo at the Waldorf.” How long do you plan to be in San Francisco? JDT I will be there for five weeks with one week of rehearsal and four weeks of performance. There will be two weeks of rehearsal and four weeks of performance. CG This past year you were in successful New York productions of "Tamburlaine the Great" and “Iceman Cometh.” How does than change the landscape for you regarding New York theatre? JDT Every project tends to open things up. Currently I’m booked for the year. NY theatre has been good to me. I’ve won an Obie for the performances in “Iceman” and “Tamburlaine” as well as a Drama Desk award. CG When you started acting 20 years ago did you know what you were getting into? You had a decent life in business at the time. JDT Like many of my colleagues I was laid off during a time when the economy was doing poorly. Banks, which I was selling computers to weren’t buying. So I got laid off and said I’ll give this dream of mine a shot while I have 18 months of severance and unemployment benefits. JDT That was the epiphany absolutely. Twenty years later I’m still doing this. I graduated in a class of twelve. Nigel Gore, my classmate, and I are the only ones still doing this. (Trinity Repertory Conservatory in Providence, Rhode Island.) The odds of graduating and staying in the business five to ten years out are so slim. Just remaining standing is some kind of achievement. It’s a process of attrition. CG In “Red Velvet” some of the reviews of Aldridge on the London stage were read as a part of the play. It was shocking to the audience to hear how vicious and racist they were. JDT I guess so but that was the racism of the time and what Britain was dealing with regarding the debate about having slaves in the colonies or not. In rehearsals I would never stay around to watch that scene. I didn’t want to be influenced before I went in for my portion of the scene. When we were doing “Othello” I would never stay around for Iago’s scenes. In reality Othello never hears or knows of Iago’s intentions. He doesn’t hear Iago plotting his demise. So why as an actor should I sit in rehearsal and watch it? That is going to affect my ability to be in the moment during performance. CG Charles Kean is playing Iago but he wants to play Othello. JDT If that’s what the company needs him to do he would but that fact that I (Aldridge) get brought in by the manager put the kybosh on that. CG Which is the better role Iago or Othello? JDT I would like to think I’ve proven that. CG Previously you talked about "Othello" as a love story. JDT Yes as a romantic love story. CG Your interpretation was unique. JDT When Othello was being played by the Keanes and MacCreadys of the world Othello was the role. It wasn’t Iago. It was only when it switched to Othello being a role for a black performer that the focus of critics shifted from Othello to Iago. For me there’s inherent racism in that. For the great classical actors of their day, in the 17th, 18th, 19th centuries playing Othello in black face was one of the greatest roles in the English speaking canon. Not just Shakespeare but the English speaking canon. It was the role that defined an actor. Can they do Othello? Now they would say what’s his Hamlet like? Then they would ask about his Othello. He wasn’t even considered as an actor until they had seen his Othello. Back in the 1960s when Olivier did Othello I watched it and wasn’t as put off by the blackface as many people were. I read a lot about his performance and what he based it on. In that performance he freed up Shakespeare’s text in a way that hadn’t been done prior. Once the role of Othello switched from white to black performers then criticism began to shift that Iago was the major role in the play. In the productions I’ve been in I’ve been trying to shift that perception and make it Othello’s play. In truth Othello is the harder and more complex role. It requires more physical, emotional and mental stamina. Iago is more of a psychological role. What I find is that for the most part when you play Othello, and you have a white male director, he is likely to be most interested in Iago and less so Othello. Hence you see productions where the calibration is off because the director has spent more time cultivating the role, the character and the actor who is playing Iago. It’s very different if there is a woman director involved. She is going to be fascinated with Othello, and his back story, the romance and the love story with Desdemona. If it’s a male director they are just not as interested, they tend to focus on the male relationship and racism. CG Tony (Simotes) directed your Othello at S&Co. JDT Tony even as good a job as he did I thought I was able to bring new levels to the Othello that he wasn’t aware of. I was focused on changing his mind from within and worked really hard to do that. I saw Tony’s mind change and realize that the play did belong to Othello. I feel I awakened him to the potential of what the role can be. The Othello in New York which I did with Arin Arbus just allowed me to extend what I had discovered with the S&Co. production, in an even more intimate setting. She focused on the love story which is how you have a strong tragedy. CG James Earl Jones played Othello. JDT He did it with Christopher Plummer. James Earl Jones wrote a great little book about the role of Othello. It’s called "Great Shakespearian Performances." I met James Earl Jones when I did “Macbeth” in New York for Theatre for a New Audience. He stayed after the show to meet the whole cast. We talked about “Macbeth” and we actually talked about “Othello.” He said, “You know what? If I were to do Othello again, I would water board Iago.” In that penultimate scene when he’s trying to get the information, he would water board him. I said “really?” He said “Yeah, I would do that.” The man’s in his 70’s and he’s still thinking about the role and things that he could do. I find that inspiring. In the book he talks about doing the role on Broadway with Christopher Plummer. He describes how Plummer kept upending the show and not taking it seriously. He got carried away with himself and went for laugh lines and all these different things. He ruined the integrity of the other actors on stage. He ruined the integrity of the play. CG Can American actors do Shakespeare on a par with the British. The language just seems to flow out of them in a different way. We had a chance to see Mark Rylance on Broadway with “Twelfth Night” and “Richard III.” Everyone in that company was so superbly articulate and finely tuned. JDT I think Americans do Shakespeare just as well. It’s an American brand of Shakespeare, which can incorporate a lot of feeling and emotion as the motor behind the text. I have seen some great British classical actors deliver Shakespearian text but I sometimes miss an emotional connection. Mark Rylance is different, he gives you the full spectrum of Shakespeare’s language. And we both know there are many great British and American actors who do the same. CG You have objected when I mentioned other performances in discussions of your work. You comment that there is no one definitive performance or production. It exists each night for a period of time and then is gone forever, it’s ephemeral. This summer in reviewing "Moon for the Misbegotten" some critics compared the performance of Audra MacDonald to other, more definitive Josies like that of Colleen Dewhurst. You take the position that each new production is a chance to reinvent. Yet critics do this all the time with references to past performances and other productions. JDT I would like to posit that critics only do that when they don’t like what they’re seeing. Then they bring up something from the old days. That’s their way of saying that this performance is not up to par. Smarter critics don’t do that. They tend to try to open up to what they see as new and if they don’t like it they have other things that they can bring forth without saying this performance is not up to par. It just says that critic is out of step because they are comparing a contemporary actor with a performance from the past. What is that? That’s a way that critics belie themselves and give away that they don’t know what the hell they are talking about. CG For example Gordon Edelstein directed “Moon for the Misbegotten” three times. For Williamstown he wanted to bring something new in the casting of Audra MacDonald. It’s his right to do that. Then people second guess that decision. What is the license to reinvent classical work? JDT You should be able to do whatever you want. It is up to other people to judge it. To take “Moon for the Misbegotten” and turn them into black migrant workers, as far as I’m concerned, worked. It brings the play to a whole new audience. If O’Neill were here and looked at it he would say “That works.” It is so interesting that he could write a story about the Irish American immigrant experience that can tie into another group of people. I don’t think that people understand how O’Neill viewed race. The character that I played in “Iceman” (Joe Mott) was based on his roommate Joe Smith. They lived together. They were good friends who loaned each other money. When O’Neill was inebriated Joe would pick him up (from the bar) and bring him home and nurse him back to health. They were good friends and O’Neill wanted to honor that relationship and put him in the play. He didn’t have to include Joe Mott in order for “Iceman” to be a great play. It was a great play without Joe Mott. He put him in to say this is my friend and his experience of being an African American man in America at this time, is a valid one and needs representation. I want to honor my friend and the African Americans who are going through this struggle. So he put Joe in that bar and he has that big speech about racism which is a galvanizing and pulverizing speech on the emotional effects of racism and what it’s like to be marginalized. His speech just erupts out of this character. O’Neill knew his characters intimately. CG He left and came back. JDT As they all do. It’s not just Joe. They all leave and come back. The community they have found in the bar is better than the community of the outside world. CG How have things changed in the past twenty years? We like to think that there is progress and then there is Ferguson and all the other incidents. Has anything really changed? CG Does that inform your desire to do the story of Ira Aldridge? JDT I think it gives resonance to the story of Ira Aldridge considering how courageous he was in terms of what he faced in 19th century London. CG Much of the outrage came from the fact that during the murder scene Aldridge, as Othello, grabbed Tree (Desdemona) resulting in bruises on her arm. That was unthinkable at the time on stage. In his personal life Aldridge married a white woman. As did Jack Johnson (world champion boxer). JDT During the time of the play they were trying to determine whether they were going to abolish slavery in the colonies. So the discussion at the time was about whether the black man could achieve intellectual, artistic, cultural success. Aldridge comes in and achieves that right off the bat. There were forces against him trying to say that wasn’t possible. If we can take down Aldridge it strengthens our argument. So it’s (reviews) journalism with a racist bent wouldn’t you say? It’s out and out racism, right? That’s what you hear in those reviews. That’s what’s so shocking about them because you, as the viewer, know that Ira didn’t do that. You know that these people who are critics and have mighty power with their pen are making an effort to disclaim him. Not only him but his race and all that he stands for. It was a targeted attack on the anti-slavery movement, the abolitionist movement. I want to be a part of a movement and company which has tolerance as its chief and foremost goal. I would like to think that the plays I have worked on, whether I’ve chosen them, or they’ve chosen me, somehow incorporate that. They incorporate my character’s experience as the other and try to relate that to an audience. I’m just like you and I want the same things as you. So look at me and treat me in the same way that you want to be treated. I would like to think that the work chooses me. I have to think that on some spiritual or mystical level there is something in them for me to exercise.